Greetings again from the darkness. On paper, it reads like some cheesy B-movie thriller on the trail of a super-hacker nicknamed “Dr. Evil of the internet” as he builds his empire by stealing the work of others. However, director Annie Goldson is dealing in reality and submerges us in the years-long saga of Kim Dotcom, the (somewhat) proud owner of the Dr Evil moniker. This is every bit as much a commentary on legalities and technology as it is on the ‘livin’ large’ lifestyle of the film’s quite colorful subject. Bordered by a security wall and monitored by cameras, the sprawling estate in Coatesville New Zealand is where we begin. It’s the home of super-hacker and entrepreneur Kim Dotcom, formerly known as Kim Schmitz, and his wife Mona and their 3 kids. Think Jordan Belfort in THE WOLF OF WALL STREET and you’ll have a good idea of the type of extreme parties that Kim and his cohorts hosted. In 2012, a pre-dawn full SWAT gear raid of the estate changed everything – and we are privy to some of the actual footage. After the raid, law enforcement threw just about every possible charge at him: money laundering, racketeering, and most crucially, copyright infringement. Perhaps you were one of his MegaUpload customers? Millions of people were, and he banked hundreds of millions of dollars from his site – a site designed for users to share files with others. Of course, it turned into a site where mostly what was uploaded and shared were digital copies of movies and music. The files spread across the globe while leaving artists and production companies empty-handed with no royalties. The question of law boiled down to this: can an online provider be protected or insulated from the (illegal) actions of its users? Kim Dotcom has been described as a parasite, a criminal and as evil. Obviously, he sees himself much differently. While reveling in his “most wanted man online” badge, he prefers to position himself as a resistance fighter … one who has simply seized an opportunity afforded by a technological revolution of which lawmakers can’t maintain pace. 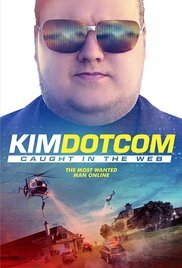 Director Goldson provides as much structure as possible to a messy and multi-faceted legal story, while also presenting the super-sized personality of Kim Dotcom … a man driven by ego, greed, and fame. He clearly thrives on his celebrity status (as evidenced by his participation in a Town Hall meeting with Julian Assange and Edward Snowden), and from a very early age became quite comfortable with relaxed ethics in our ever-evolving culture of technology. In an era of dissolving morals, he is a difficult man to muster sympathy for. It does seem, however, that he was at a minimum, a victim of over-reaching by law enforcement (from New Zealand and United States). The legalities of the search warrant and charges are a bit murky (and still being challenged), and viewers will likely teeter between ‘lock him up’ and ‘modernize the laws’. We all know the universal internet is tied to the global economy, so why are international copyright laws so fragmented and antiquated? Instead of a B-movie thriller, Ms. Goldson has delivered a true-to-life horror story … one with no clear resolution in sight. This entry was posted on Thursday, August 24th, 2017 at 8:28 pm and is filed under Documentary. You can follow any responses to this entry through the RSS 2.0 feed. You can leave a response, or trackback from your own site.